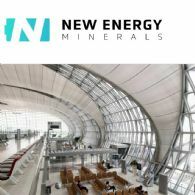 New Energy Minerals Limited (ASX:NXE) (FRA:GGY) announces that the strategic investment and joint venture transaction with Hong Kong-based investor UBezTT International Investment Holdings Ltd has now been completed. New Energy Minerals Limited (ASX:NXE) (FRA:GGY) announces that the terms of the Merger of Ruby Assets Agreement dated 14 July 2018 with Fura Gems Inc., have been amended between the parties with an amendment agreement dated 26 November 2018. 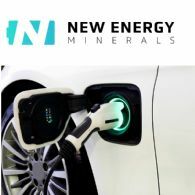 New Energy Minerals Ltd (ASX:NXE) (OTCMKTS:MTTGF) provides the Company&apos;s 2018 Annual General Meeting Presentation. 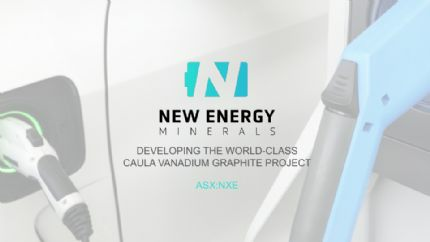 New Energy Minerals Limited (ASX:NXE) (FRA:GGY) is pleased to announce that it has entered into a binding agreement ("Agreement"), with a Hong Kong-based investor group, in relation to a strategic equity placement and asset level investment and incorporated joint venture in respect of the Caula Vanadium-Graphite project. 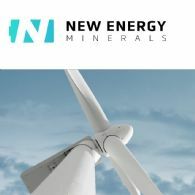 New Energy Minerals Limited (ASX:NXE) (FRA:GGY) is pleased to provide an update to the market in relation to the Company&apos;s activities for the period ending 30 September 2018. 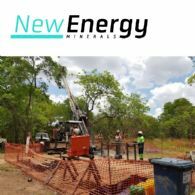 New Energy Minerals Ltd (ASX:NXE) (FRA:GGY) provides the Company&apos;s latest Investor Presentation. New Energy Minerals Limited (ASX:NXE) (FRA:GGY) is pleased to report the results of an independent Scoping Study completed by mining consultant group Bara International on the Company&apos;s 80% owned Caula Vanadium Graphite Project located in Mozambique. Mustang Resources Limited (ASX:MUS) is pleased to announce that following approval by shareholders on 2 October 2018 and registration by the Australian Securities and Investment Commission, the Company&apos;s corporate name has changed to "New Energy Minerals Ltd", to reflect its focus on vanadium and graphite exploration and mining, critical commodities for the rapidly growing New Energy Market. 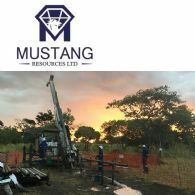 Mustang Resources Ltd (ASX:MUS) (FRA:GGY) (OTCMKTS:MTTGF) is pleased to announce that preliminary vanadium testwork has produced outstanding recovery and concentrate results, from bench-scale metallurgical testwork, on ore from the Fresh Zone of the Caula Vanadium-Graphite Project in Mozambique. Mustang Resources Ltd (ASX:MUS) (OTCMKTS:MTTGF) provides the Company&apos;s Annual Report to shareholders. Mustang Resources Ltd (ASX:MUS) (OTCMKTS:MTTGF) provides the Company&apos;s latest Investor Presentation at Hong Kong Roadshow. 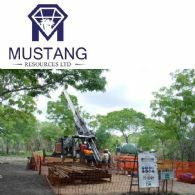 Mustang Resources Ltd (ASX:MUS) (FRA:GGY) (OTCMKTS:MTTGF) is pleased to announce that the feasibility study drilling program at its flagship Caula Vanadium-Graphite project in Mozambique has been successfully completed ahead of schedule. On 31 August 2018 Mustang Resources Limited (ASX:MUS) (OTCMKTS:MTTGF) issued a shareholder letter entitled "Mustang to be renamed "New Energy Minerals Ltd to reflect its focus on the world-class Caula Vanadium-Graphite Project". 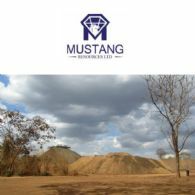 Mustang Resources Ltd (ASX:MUS) (OTCMKTS:MTTGF) provides the Shareholder Letter. Mustang Resources Limited (ASX:MUS) (OTCMKTS:MTTGF) is pleased to announce that it has obtained key approvals and waivers with Arena Investors L.P in an amendment deed dated 14 August 2018. 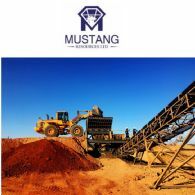 Mustang Resources Limited (ASX:MUS) (FRA:GGY) (OTCMKTS:MTTGF) is pleased to announce that it has received formal commitments to raise approximately AU$2.4 million (before costs) via private placement to professional and sophisticated investors and some of the Company&apos;s directors. 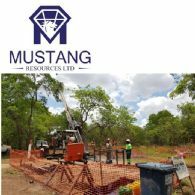 Mustang Resources Ltd (ASX:MUS) (FRA:GGY) (OTCMKTS:MTTGF) is pleased to announce that the feasibility study drilling program at its flagship Caula Vanadium-Graphite project in Mozambique is well underway. Mustang has planned 4,075m of diamond and reverse-circulation drilling to be completed in Q3 of 2018. Mustang Resources Ltd (ASX:MUS) (OTCMKTS:MTTGF) provides the Company&apos;s Quarterly Activities Report for the period ending 30 June, 2018. Following discussions with the ASX regarding compliance with clause 51 of the JORC Code 2012 and Listing Rule 5.6, Mustang Resources Ltd (ASX:MUS) (OTCMKTS:MTTGF) hereby retracts the below statements made by Edison Investment Research Ltd regarding their "in-situ" peer group resource multiple valuation of the Caula Vanadium-Graphite project. Mustang Resources Ltd (ASX:MUS) (OTCMKTS:MTTGF) provides the Company&apos;s July 2018 Investor Presentation. 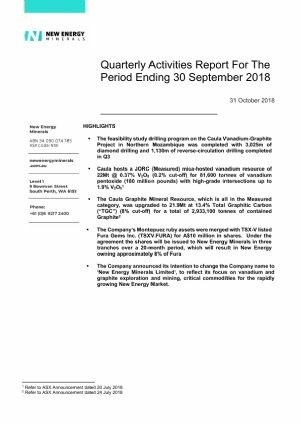 Mustang Resources Ltd (ASX:MUS) (FRA:GGY) (OTCMKTS:MTTGF) is pleased to announce that its Caula Vanadium-Graphite project in Mozambique has taken another key step towards development with the completion of an upgraded JORC-compliant Graphite Mineral Resource estimate. Mustang Resources Ltd (ASX:MUS) (FRA:GGY) (OTCMKTS:MTTGF) is pleased to announce that its Caula Vanadium-Graphite project in Mozambique has taken another key step towards development with the completion of the maiden JORC-compliant vanadium Mineral Resource estimate. Mustang Resources Ltd (ASX:MUS) (OTCMKTS:MTTGF) is pleased to announce that it has entered into a merger agreement for its Montepuez ruby assets with TSXV-listed Fura Gems Inc. (CVE:FURA) for A$10 million in shares. 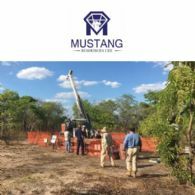 Mustang Resources Ltd (ASX:MUS) (OTCMKTS:MTTGF) is pleased to report further strong assay results from drilling at its Caula Graphite-Vanadium Project in Mozambique. Mustang Resources Ltd (ASX:MUS) (OTCMKTS:MTTGF) is pleased to announce outstanding results from further graphite metallurgical testwork at its Caula Graphite-Vanadium Project in Mozambique. Mustang Resources (ASX:MUS) (OTCMKTS:MTTGF) is pleased to announce that it has received strong results from preliminary ore sorting testwork conducted on drill core from its Caula Graphite-Vanadium project in Mozambique. 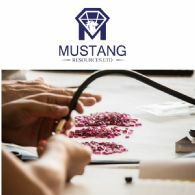 Mustang Resources (ASX:MUS) (OTCMKTS:MTTGF) is pleased to announce that it is exporting a further 34,400 carats of medium and higher grade rubies to its sales office in Thailand. The rubies were recovered as part of Mustang&apos;s bulk sampling operations at its Montepuez project in Mozambique from January to May 2018. Mustang Resources (ASX:MUS) (OTCMKTS:MTTGF) is pleased to announce that it has agreed to amend the terms of the A$19.95 million investment facility from Arena Investors LP (refer to ASX Announcement dated 8 January 2018 "Mustang Secures $19.95 million funding package from leading institutional investor"). Mustang Resources Ltd (ASX:MUS) (OTCMKTS:MTTGF) is pleased to announce that it has placed 21.74 million fully paid ordinary shares at 2.3 cents to raise $500,000 before costs under the recently completed Entitlement Offer. Mustang Resources Ltd (ASX:MUS) (OTCMKTS:MTTGF) is pleased to announce more outstanding drilling results from its Caula vanadium-graphite project in Mozambique. 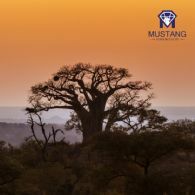 Mustang Resources Ltd (ASX:MUS) (OTCMKTS:MTTGF) provides the Company&apos;s Quarterly Activities Report. Mustang Resources Ltd (ASX:MUS) (OTCMKTS:MTTGF) provides the Company&apos;s latest presentation. Mustang Resources (ASX:MUS) (OTCMKTS:MTTGF) is pleased to announce that it has discovered a new ruby-bearing gravel deposit just 3.5km from its processing plant at the Montepuez Ruby Project in Mozambique. Mustang Resources Limited (ASX:MUS) (OTCMKTS:MTTGF) refers to its announcement made on 11 April 2018, entitled "Maiden Ruby Sales from Newly Established Office in Thailand". 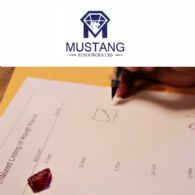 Mustang Resources Limited (ASX:MUS) (OTCMKTS:MTTGF) is pleased to advise that it has made strong early progress with its recently implemented sales and marketing strategy with the first ruby sales from its newly-established sales and marketing office in Chanthaburi, Thailand. Mustang Resources Ltd (ASX:MUS) (OTCMKTS:GGPLF) provides the Company&apos;s latest Corporate Presentation. Mustang Resources Limited (ASX:MUS) (OTCMKTS:GGPLF) announces that its non-renounceable pro rata rights issue of one (1) new share offered for every four (4) fully paid ordinary shares held by eligible shareholders at an issue price of $0.023 per New Share closed on Thursday, 22 March 2018 at 5.00pm WST. 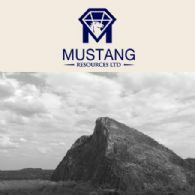 Mustang Resources Ltd (ASX:MUS) (OTCMKTS:GGPLF) is pleased to provide an update on the recently completed diamond drilling program at the Company&apos;s graphite Licence 5873L, to the south of the main part of the high-grade Caula Graphite & Vanadium Project in the world-class mineral province in Northern Mozambique. Mustang Resources (ASX:MUS) (OTCMKTS:GGPLF) is pleased to announce that a strategic review led by new Managing Director Dr Bernard Olivier concludes the Company&apos;s Caula Graphite Project in Mozambique could achieve first production by the middle of next year. Mustang Resources Ltd (ASX:MUS) (OTCMKTS:GGPLF) is pleased to announce good drilling results from its Caula Graphite and Vanadium Project in Mozambique. Mustang Resources (ASX:MUS) (OTCMKTS:GGPLF) is pleased to announce that a strategic review led by new Managing Director Dr Bernard Olivier has found that the Company&apos;s Caula Graphite Project in Mozambique is well on track for first production by the middle of next year. Mustang Resources (ASX:MUS) (OTCMKTS:GGPLF) is pleased to announce the appointment of experienced resources executive Dr. Evan Kirby as a Non-Executive Director. 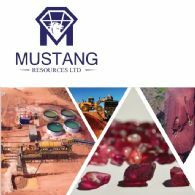 Mustang Resources Ltd (ASX:MUS) (OTCMKTS:GGPLF) is pleased to announce that following a recently-completed review of its sales and marketing strategy, the Company has decided to implement a series of measures which better reflect the current exploration and development status of its Montepuez Ruby Project in Mozambique. Mustang Resources (ASX:MUS) (OTCMKTS:GGPLF) is pleased to announce that it has taken another key step in its strategy to establish Montepuez as a world-class ruby project, upgrading another exploration licence to a mining concession. Mustang Resources Limited (ASX:MUS) (OTCMKTS:GGPLF) advises that further to the announcement today 22 February 2018 in relation to the Company&apos;s one-for-four non-renounceable entitlement issue the time table contained in the Offer Document has been updated. Further to an announcement on 8 January 2018 of a proposed entitlement share issue, Mustang Resources (ASX:MUS) (OTCMKTS:GGPLF) is pleased to announce that it now proposes revised terms to raise up to $4,435,742 by a one-for-four non-renounceable entitlement issue at 2.3 cents per share. Mustang Resources (ASX:MUS) (OTCMKTS:GGPLF) is pleased to announce that bulk sample processing and exploration activities on its Montepuez Ruby Project, in Northern Mozambique are delivering increasingly strong results. Mustang Resources Ltd (ASX:MUS) (OTCMKTS:GGPLF) provides the Company&apos;s latest Investor Presentation. Mustang Resources Ltd (ASX:MUS) (OTCMKTS:GGPLF) is pleased to announce it has completed the diamond drilling campaign which will underpin the concept study on its 80%-owned Caula Graphite Project in Mozambique. Mustang Resources (ASX:MUS) (OTCMKTS:GGPLF) provides the following report on its activities for the three months to 31 December 2017. 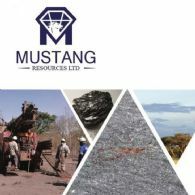 Mustang Resources (ASX:MUS) (OTCMKTS:GGPLF) is pleased to announce the appointment of Dr. Bernard Olivier to the Board as Managing Director and Cobus van Wyk as Chief Operating Officer and Executive Director. Mustang Resources Limited (ASX:MUS) (OTCMKTS:GGPLF) is pleased to advise that it has received the proceeds of the insurance claim relating to the rubies and corundum stolen in the robbery at its Montepuez Ruby Project in September 2017 (see ASX release dated 26 September 2017). Mustang Resources Ltd (ASX:MUS) (FRA:GGY) (OTCMKTS:GGPLF) is pleased to announce that it has secured a A$19.95 million funding facility under a convertible note facility (Convertible Note Deed) with a leading US institutional investor. Mustang Resources Ltd (ASX:MUS) is pleased to announce that further metallurgical testwork on Oxide and Fresh samples taken from its 80% owned Caula Project (Licence 6678L) has provided more firm evidence of the quality of the mineralisation. Mustang Resources Ltd (ASX:MUS) (OTCMKTS:GGPLF) The Montepuez Ruby Project in Mozambique, although still very much in the exploration stage, made significant advances during the year. Mustang Resources Limited (ASX:MUS) (OTCMKTS:GGPLF) has conducted an internal review of its recent first ruby auction and an assessment of its commercial and exploration strategy. 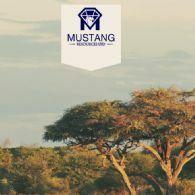 Mustang Resources (ASX:MUS) (OTCMKTS:GGPLF) announces that Christiaan Jordaan has resigned as Managing Director, effective today. He remains as a Non-Executive Director of the Company. Further to the announcement last week on the tender results, Mustang Resources Ltd (ASX:MUS) (OTCMKTS:GGPLF) wishes to confirm that it is currently undertaking a detailed assessment of the market intelligence gathered from the first tender concluded Monday last week. 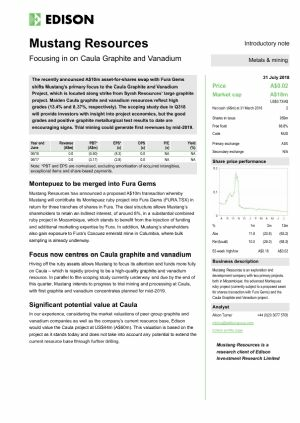 Mustang Resources Ltd (ASX:MUS) (OTCMKTS:GGPLF) is pleased to announce its maiden JORC Compliant Mineral Inferred Resource estimate for the Caula Graphite Deposit (Licence 6678L). As foreshadowed in previous announcements to the market, Mustang Resources Limited (ASX:MUS) (OTCMKTS:GGPLF) confirms that it has completed its inaugural ruby tender, which was held between 27 and 30 October 2017 in Port Louis, Mauritius. The tender results were received by the Company at 8pm AEDT on Monday 30 October 2017. Mustang Resources Ltd (ASX:MUS) (OTCMKTS:GGPLF) provides the Company&apos;s Quarterly Activities Report. Mustang Resources (ASX:MUS) (OTCMKTS:GGPLF) is pleased to announce that it will take a total of 405,000 carats to its maiden rough ruby tender later this week - more than double the 200,000 carats it initially targeted when setting the sale date. Mustang Resources Ltd (ASX:MUS) (OTCMKTS:GGPLF) provides the Company&apos;s latest presentation at Australian Microcap Investment Conference. 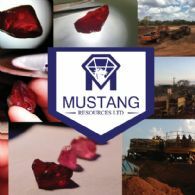 Mustang Resources (ASX:MUS) (OTCMKTS:GGPLF) is pleased to announce that its ruby inventory has grown strongly to 352,260 carats, putting the Company in an outstanding position in the lead-up to its maiden rough ruby tender to be held between 27 and 30 October 2017 in Port Louis, Mauritius. Mustang Resources Ltd (ASX:MUS) (OTCMKTS:GGPLF) provides the Company&apos;s latest North American Investor Presentation. Mustang Resources Ltd (ASX:MUS) continued with development of its new assets, being ruby and graphite exploration projects in Mozambique with a principal focus on the Montepuez Ruby Project. Mustang Resources (ASX:MUS) (OTCMKTS:GGPLF) is pleased to announce that its ruby inventory has soared to 277,852 carats. Mustang Resources (ASX:MUS) (OTCMKTS:GGPLF) is pleased to announce that preparations for the maiden auction of its rubies in October are firmly on track, with its inventory rising to 176,522 carats. Mustang Resources Ltd (ASX:MUS) (OTCMKTS:GGPLF) is pleased to announce that its ruby inventory at the Montepuez project in Mozambique continues to grow, reaching 147,052 carats. Mustang Resources Ltd (ASX:MUS) (OTCMKTS:GGPLF) provides the Company&apos;s latest Corporate Presentation at Diggers and Dealers Mining Forum. Mustang Resources Ltd (ASX:MUS) (OTCMKTS:GGPLF) is pleased to announce the issuance of an updated research report compiled by Independent Investment Research ("IIR") for distribution to their network. This follows a site visit by the IIR analyst to the Montepuez Ruby Project at the end of June 2017. Mustang Resources Ltd (ASX:MUS) (OTCMKTS:GGPLF) is pleased to provide the report on its activities during the June Quarter 2017. Mustang Resources Ltd (ASX:MUS) (OTCMKTS:GGPLF) is pleased to announce that it has received strong results from initial beneficiation testwork conducted on both oxide and fresh samples taken from its 80 per cent owned Caula Graphite Project (Licence 6678L). Mustang Resources Ltd (ASX:MUS) (OTCMKTS:GGPLF) is pleased to announce that it has secured a A$8.5 million funding facility under an 18-month term convertible note facility with a leading US institutional investor, ensuring that it is fully funded through to its upcoming maiden rough ruby tender in October 2017. Mustang Resources Limited (ASX:MUS) (OTCMKTS:GGPLF) is pleased to advise that Australian stockbroking firm Hartleys Limited has initiated coverage on the Company with a comprehensive research report released today on its Montepuez Ruby Project and Balama Graphite Project, located in northern Mozambique. Mustang Resources Ltd (ASX:MUS) (OTCMKTS:GGPLF) provides the Company&apos;s latest Investor Presentation held in July 2017. Mustang Resources Ltd (ASX:MUS) (OTCMKTS:GGPLF) is pleased to announce that its ruby inventory has grown to 120,397 cts, putting it comfortably on schedule to meet its target of 200,000cts in time for its first closed bid tender in October this year. 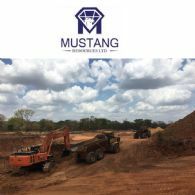 Mustang Resources Ltd (ASX:MUS) (OTCMKTS:GGPLF) is pleased to announce that it has taken another significant step in its strategy to ramp up processing at the Montepuez Ruby Project in Mozambique with the start of bulk sampling on the recently-acquired Licence 8245L area. Mustang Resources Ltd (ASX:MUS) (OTCMKTS:GGPLF) is pleased to provide the Company&apos;s latest Investor Presentation at 121 Mining Investment Conference held on 6 and 7 June, 2017. Mustang Resources (ASX:MUS) (OTCMKTS:GGPLF) is pleased to announce that videos recording the Company&apos;s Montepuez Ruby Project are available for viewing. The videos show the bulk sampling operations and the recently-upgraded processing plant in operation. 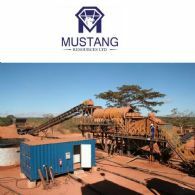 Mustang Resources Ltd (ASX:MUS) (OTCMKTS:GGPLF) is pleased to announce that commissioning of the upgraded processing plant at its Montepuez Ruby Project in Mozambique has been highly successful and processing rates are now ramping up. Mustang Resources Ltd (ASX:MUS) (OTCMKTS:GGPLF) is pleased to provide the Company&apos;s latest Resources Rising Stars Investor Presentation May 2017. Mustang Resources Ltd (ASX:MUS) (OTCMKTS:GGPLF) is pleased to announce the issuance of a research report compiled by Independent Investment Research for distribution to their network. Mustang Resources Ltd (ASX:MUS) (OTCMKTS:GGPLF) is pleased to announce that highly experienced resource industry executive Peter Spiers has been appointed as a Non-executive Director. Mustang Resources Ltd (ASX:MUS) (OTCMKTS:GGPLF) is pleased to provide the Company&apos;s latest Investor Presentation May 2017. Mustang Resources Ltd (ASX:MUS) (OTCMKTS:GGPLF) is pleased to provide the following report on its activities during the March quarter 2017. 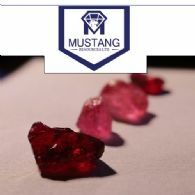 Mustang Resources (ASX:MUS) (OTCMKTS:GGPLF) is pleased to announce that it intends to sell the first rubies from its rapidly growing gem-ruby inventory as rough stones at an auction/tender to bulk buyers targeted for October 2017. 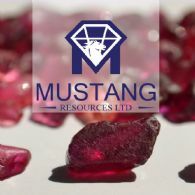 Mustang Resources Ltd (ASX:MUS) (FRA:GGY) is pleased to announce that its gem-ruby inventory has grown to 63,989cts with strong receipts from prospecting teams and processing from the Alpha deposit in the first three weeks of March. Mustang Resources Ltd (ASX:MUS) (FRA:GGY) is one of only two listed ruby miners in the world and is developing its flagship Montepuez Ruby Project in Mozambique. Mustang has identified multiple ruby deposits on its 195sqkm land package, where it is conducting an aggressive drilling campaign to calculate a JORC Resource in the second half of this calendar year. Mustang Resources Ltd (ASX:MUS) is pleased to provide the Company&apos;s latest Investor Presentation. 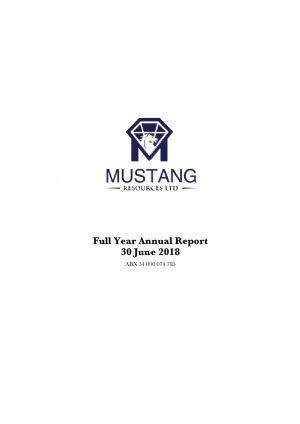 This half-year report covers the consolidated entity consisting of Mustang Resources Limited (ASX:MUS) (OTCMKTS:GGPLF) and the entities it controlled during the half-year ended 31 December 2016. Mustang Resources (ASX:MUS) (OTCMKTS:GGPLF) is pleased to announce that it is set to export the second commercial parcel of gem-quality rubies from its Montepuez Project in Mozambique in a move which is expected to significantly increase the Company&apos;s sales revenue in 2017. Mustang Resources Ltd (ASX:MUS) is pleased to announce that it has made a spectacular high-grade graphite discovery at its 80% owned Caula Project (License 6678L) along geological strike of the Syrah Resources (ASX:SYR) world-class Balama graphite project in Mozambique. Mustang Resources Ltd (ASX:MUS) is pleased to announce the issuance of a research report compiled by New York-based consulting firm, RB Milestone Group LLC ("RBMG"), for distribution to its North American investor network. Mustang Resources Ltd (ASX:MUS) is pleased to announce that Managing Director, Christiaan Jordaan, will be undertaking a series of investor meetings in North America between 1 and 8 March 2017 to introduce the Company&apos;s Montepuez Ruby Project to sophisticated and institutional investors. Mustang Resources Ltd (ASX:MUS) is pleased to announce that it has agreed to acquire a 65 per cent interest in a new highly strategic ruby license (License 8245L) which borders its existing Montepuez Ruby Project in Mozambique. Mustang Resources Ltd (ASX:MUS) is pleased to announce that Baker Young Stockbrokers has released an updated research report on the Montepuez Ruby Project and the Balama Graphite Project which Mustang is developing in Northern Mozambique. 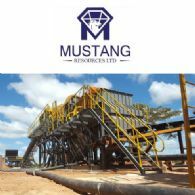 Mustang Resources Ltd (ASX:MUS) is pleased to announce that its increase of processing capacity is firmly on track, with the first phase of its processing plant ramp-up successfully completed at the Montepuez project in Mozambique. Mustang Resources Ltd (ASX:MUS) is pleased to report encouraging preliminary results from the recently completed diamond drilling program at the Company&apos;s high-grade Balama Graphite Project, located in the world-class graphite province of Northern Mozambique. 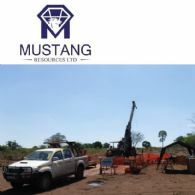 Mustang Resources Ltd (ASX:MUS) is pleased to provide the Company&apos;s latest Investor Presentation titled "An Emerging Gemstone Miner in Mozambique". 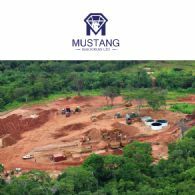 The December 2016 Quarter has been a pivotal period for Mustang Resources (ASX:MUS) which saw the Company put in place all of the foundations required to unlock the value of its flagship Montepuez Ruby Project in the Cabo Delgado Province of north-eastern Mozambique and become a significant new player in the rapidly growing global coloured gemstone market. 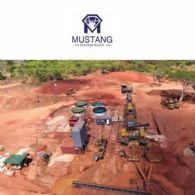 Mustang Resources Ltd (ASX:MUS) is pleased to advise that its strategy to ramp up production and generate the first sales revenue at its Montepuez Ruby Project in Mozambique is firmly on track, with commissioning of the relocated processing plant now completed. Mustang Resources Limited (ASX:MUS) is pleased to announce that it has received formal commitments to raise $2.8 million in an oversubscribed placement led by US institutional investors in conjunction with Australian sophisticated investors through the issue of 133.4 million new ordinary shares, ranking pari passu with existing holders, at an issue price of 2.1 cents per share. Mustang Resources Limited (ASX:MUS) is pleased to provide an update concerning the progress being made at its flagship Montepuez Ruby Project, as well as recent developments on its Balama Graphite Project.